Despite not having the best picture quality, it’s amazing at places you don’t want to use your expensive smartphone. Camileo Clip of Toshiba has a nearly same size and weight as a matchbox. The 1.5-inch screen fits entirely in a big plastic tong which helps you to attach it to a belt or an overcoat pocket while walking. The rubber coating also helps it to resist water and shock. This brings you confidence to use Camileo Clip in environments that you won’t use camcorder, such as noisy party and outdoor activities in winter. Despite the size, Camileo Clip is not a VGA webcam. It can record in Full HD 1080p at the speed of 30fps, or 720p at 30fps or 60fps. You can also record videos in 480p resolution at at the speed of 30fps. As common as the normal camcorders, you can take photos. 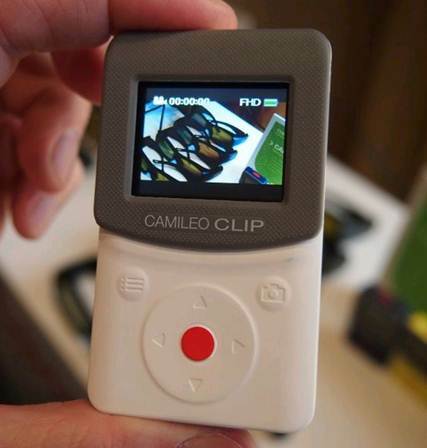 Camileo Clip takes 16MP photos if you just want to snap. Sadly, although there’s nothing to surprise when Clip only has 128MB attached storage. You will need microSD memory card to record videos, because 128MB capacityis enough for a 46-second Full HD scene. A microSD 1GB memory card can only record 15 minutes of movies, so it’s the best to use at least microSD 4GB card. Camileo Clip has battery timer of 1 hour and 6 minutes. It seems not much for the recording time, but it will be fine if you just record small sections of an event. Battery is sealed in Clip cover so that you can’t change battery; this is a camcorder that you only want to use for short records. About the image quality, we aren’t impressed with the image stabilization system, especially when moving forward. Besides, there are vibrations when panning the camera slowly. Image noise is very common in light rooms or dark environments and high image compression means that the scenes of Clip lag behind the scene of a full camcorder. However, it’s hard to criticize the 60-pound Clip with these errors. Its scenes are pretty good for a price level like that. Clip doesn’t have optical zoom, but 10x digital zoom. We don’t need to zoom too far to make the scene become blurred and affected by digital artifacts so it’s better to leave this function alone. Similarly, stills of Clip are in poor quality due to compression. Some areas of the image are blurred and lacks detail. The controls of Clip are quite difficult to use. Record button and menu button are easy to use, but its four direction buttons are small and soft, and none of them provide any feedback when pressed. Directing the menus of Clips is easy to do, but you can see just one menu option each time; it takes time to get used to every option in a sub-menu. Fortunately, Clip has many features that support your video making, for example: motion detection, face tracking, slow motion, available record, time lapse, continuous play and sound recorder, as well as standard scene effects, white balance and color filter. It also comes with 2 DVDs which contains Plus Trial version of Video Deluxe MX, and useful user manual document. Many features are not as complicated as a knife-switch, but it’s good to have them, and the software for desktop computer is a plus. The controls of Clip are pretty difficult to use. Good feature of Camileo Clip is webcam. We think it work well as a webcam, although it’s pretty expensive if you only use it for that purpose. You can find cheaper options at other places such as HD Webcam C270 15 pounds of Logitech. 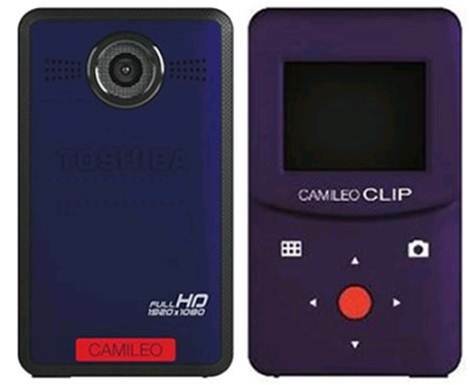 Camileo Clip of Toshiba is a good advice but it’s hard to see the reason why you want to use it instead of smartphone, especially when many smartphones is now recording videos in 720p or 1080p format; many smartphones also record video in higher quality. Thanks to that reason, Clip is very suitable for those who don’t want to bring the expensive smartphone to a party or another environment where it can be damaged.